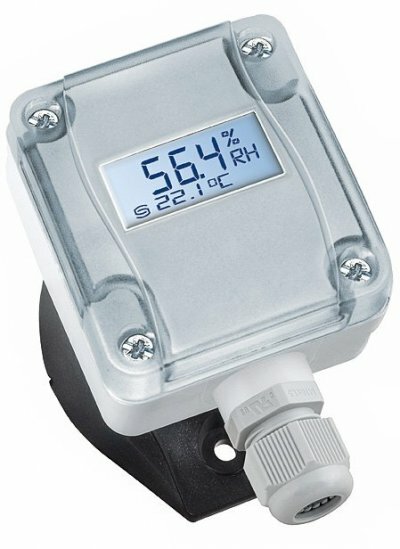 The duct humidity and temperature transmitter HDTT measures the relative humidity and temperature of air. 0-10 Vdc or 4-20 mA and is optional available with or without display. Display-versions show actual humidity and actual temperature. Terminal box enclosure made of impact-resistant plastic with enclosure cover with quick-locking screws. The duct humidity and temperature transmitter HDTT has four switchable temperature ranges and is applied in non-aggressive dust-free ambiences in refrigeration, air conditioning, ventilation and clean room technology. Relative humidity (in % r. H.) is the quotient of water vapour partial pressure divided by the saturation vapour pressure at the respective gas temperature. These measuring transducers are designed for exact detection of humidity. 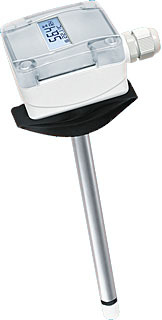 A digital long-term stable sensor is used as measuring element for humidity measurement. Fine adjustment by the user is possible. Mounting flange is included in the scope of delivery for the the duct humidity and temperature transmitter HDTT. HDTT 420 with 2 x 4-20 mA outputs. PT100, PT1000, Nickel, NTC 10K, NTC 1.8K,NTC 20K and PTC etc. 4 different measuring temperature ranges selectable by jumpers on pcb -35°C to +35°C, -35°C to +75°C, 0 to 50°C or 0 to +80°C. - Temperature +/- 0.8 Kelvin at +20°C.